A County Armagh man who threatened to kill a crew member and punched the seat of an autistic child during a flight has been jailed for 10 months. Kevin O’Hare, 27, also swung his fists at the female cabin attendant on the four-hour Jet2 flight from Fuerteventura to Belfast on 5 August. The 12-year-old was screaming as a result of O’Hare punching the seat in front of him. O’Hare screamed and swore at police when he was arrested in Belfast. The defendant, of Keggall View in Camlough, had been drinking since 11:00 BST before boarding the evening flight to Belfast International Airport, his lawyer told Antrim Magistrates’ Court. 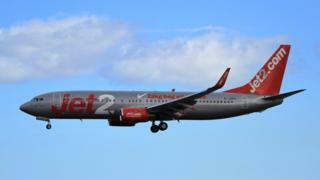 He was handed a five-month prison sentence for making threats to kill and five months for assaulting cabin crew. During sentencing, the district judge said O’Hare’s behaviour was “appalling”, adding that it was becoming “all too prevalent” on aircraft. In his view, the “custody threshold” had been crossed and a “clear message” must be sent that this type of behaviour would not be tolerated, added the judge. O’Hare “doesn’t recollect anything in relation to the incident” and acknowledges that his behaviour was “completely disgraceful and unacceptable”, added the lawyer. He said his client had “a longstanding difficulty with alcohol, going back over 10 years”. There was “no physical contact at any stage” between the defendant and the crew member, the lawyer said, but his client accepted he would have caused the woman to fear an assault “while flailing his arms about”. O’Hare was currently seeking help for his issues with alcohol, said the lawyer, and submitted three references to the court on his client’s behalf. A prosecution lawyer said the defendant showed no remorse during his police interview. He was fined £200 for failing to obey a lawful command, and a further £200 for entering an aircraft when drunk. The district judge said O’Hare was also in breach of a crown court suspended sentence, adding that while he had no power to activate this, the court would write to Newry Crown Court.